In June, the discovery of a live silver carp just nine miles from Lake Michigan sent shock-waves through the Great Lakes community. It also renewed calls from Great Lakes lawmakers and conservation organizations like National Wildlife Federation for the Army Corps of Engineers to release a draft feasibility plan for improving defenses at the Brandon Road Lock and Dam in Joliet, Illinois. The plan had been expected in late February but delayed indefinitely by the Trump administration. After over five months, we now have that plan. The Army Corps of Engineers (Corps) released its long-awaited plan for keeping Asian carp out of the Great Lakes on August 7. Their plan essentially makes Asian carp run the gauntlet of multiple overlapping deterring technologies at the Brandon Road Lock and Dam near Joliet, Illinois, designed to keep them from entering the Chicago Area Waterway System (CAWS) which connects the Mississippi River basin to the Great Lakes. Before the plan can be implemented, though, it must run a gauntlet of its own. The Corps evaluated multiple options ranging from no additional action to complete lock closure before recommending a Tentatively Selected Plan (Plan), which combines all of the structural and nonstructural technologies they considered independently in the other options. These include an engineered channel fitted with an electric barrier, water jets, complex noise, and a flushing lock. This combination of technologies was selected because, together, they provide the greatest protection against Asian carp while still keeping navigation open. This plan is the best near-term option for getting additional defenses in place to prevent Asian carp from establishing a population in Lake Michigan, which is more critical than ever with the discovery of the live silver carp this June just nine miles from Lake Michigan, and about 28 miles beyond the only current defense, a set of electrical barriers in the CAWS. A Southern Illinois University autopsy revealed that the four-year-old male silver carp spent the majority of its life below the barriers in the Middle Mississippi/Illinois River and Des Plaines River waters, and had only lived in Little Calumet River waters where it was found for a few weeks or months. Though the U.S. Fish and Wildlife Service does not know how it got past the barriers, the fact remains that, somehow, it did. The release of this draft feasibility study on options for Brandon Road – including the Tentatively Selected Plan – is just a middle stage in a long process. Once the Chief’s Report is complete, it will be submitted to Congress for authorization of $179 million, its share of the total estimated $275 million cost of the project. In the meantime, the Corps must find a non-federal sponsor – such as the State of Illinois or a joint cost-share among all the Great Lakes states – for the other approximately $96 million. However, because this issue of such national importance, it is entirely appropriate for 100% federal funding. Only when Congress authorizes the project can construction begin, which the Corps estimates will be completed in 2025. While $275 million seems like a lot, consider that the Great Lakes sport-fishery generates $7 billion annually in economic activity each year, according to a 2007 report by Southwick Associates on behalf of the American Sportfishing Association. And while 2025 seems like a long way off, consider that if we had started a project like this in 2010 when the first (and only other) live Asian carp was found on the wrong side of the electric barriers, it might have stopped the one found this year. It’s possible a few more Asian carp will get through before it’s completed, but what if a reproducing population doesn’t get through until 2026, and we could have prevented it by acting now? The Corps’ plan is not the perfect long-term solution; we still need ongoing planning for a solution to prevent the two-way transfer of invasive species between the Great Lakes and Mississippi River basins. Making Asian carp run a gauntlet of electric barriers, water jets, complex noise and a flushing lock at a critical choke-point like the Brandon Road Lock and Dam, though, is the best option we have now to save not just the Great Lakes fisheries, but the fisheries and recreational tourism economies of their connected inland bays, rivers and lakes. So let’s not waste any more time: stop Asian carp now. Click here to comment in support of the Army Corps’ of Engineers plan to keep Asian carp out of the Great Lakes! Take Action to Stop Asian Carp! 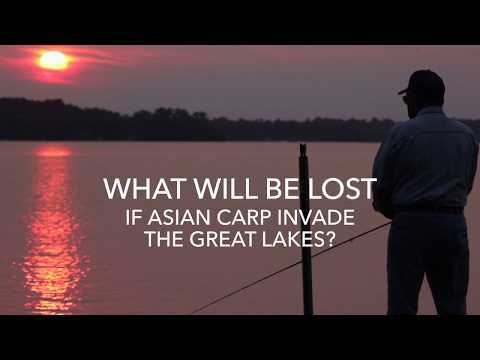 Take action to keep Asian carp out of the Great Lakes! Go to http://bit.ly/NWFstopasiancarp to comment in support of the Army Corps of Engineers plan to stop Asian carp at Brandon Road.